Over the past decade, we have witnessed an apparent convergence of views among competition agency officials in the European Union and the United States on the appropriate goals of competition law enforcement. Antitrust policy, it is now suggested, should focus on enhancing economic efficiency, which we are to believe will promote consumer welfare. Recent EU Commission Guidelines on the application of Article 101 TFEU appear to banish considerations that cannot be construed as having an economic efficiency value – such as the environment, cultural policy, employment, public health, and consumer protection – from the application of Article 101 TFEU. explores what the role of non-efficiency considerations in the application of Article 101 TFEU could and should be under the modernized enforcement regime. Part I The Objectives of US and EU Antitrust Policy: A Historical and Comparative Perspective. Chapter 1 Antitrust’s Objectives: Theoretical Perspectives. Chapter 2 The Objectives of US Antitrust Policy. Chapter 3 The Objectives of EU Antitrust Policy. Part II The Role of Non-efficiency Considerations in the Application of Article 101 TFEU: Case Study of the Audiovisual Sector. Chapter 4 The Justifiability of Incorporating Non-efficiency Considerations in Article 101 TFEU. Chapter 5 More Than a Game? The Specific Characteristics of Sport and Its Societal Role. Chapter 6 Access to Content by Final Consumers. Conclusions to Part II. Final Conclusions. "The economic crisis has prompted competition policymakers to revisit fundamental issues, such as what is competition and what are the goals of antitrust law. The battle over antitrust begins with its goals. Ben Van Rompuy's book is a timely and valuable contribution to this important debate." 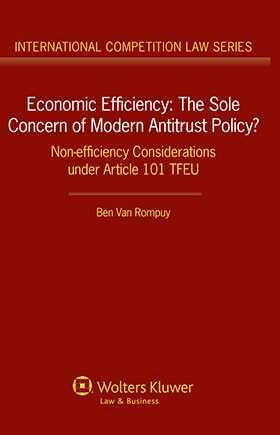 "This book has no predecessors or peers in its detailed scrutiny of the main justifications for precluding non-efficiency ends from antitrust law and policy. With its valuable lessons about the practical importance of the choice of and emphasis upon goals, this incomparable book has a great deal to offer all practitioners, policymakers, and academics concerned with the future of competition law in Europe and beyond." Foreword by William E Kovacic, Global Professor of Competition Law and Policy, George Washington University Law School. "Academics and decision makers will appreciate this book. Lawyers dealing with competition problems in the sports and media fields will benefit from the rich discussions of the relevant decisional practice (Chapters 4–6)."